If anyone puts a challenge to Zach Hiotis, be prepared for him to tackle it head-on and succeed. When architects told Zach his 45-square-metre café would barely fit one espresso machine, he found a way to fit two Synesso Hydra machines (two and three group), three Mythos grinders, one Mahlkönig EK43 grinder, one Marco SP9 filter brewer, one Marco Bru F60M for batch brew, and two Übermilk units for milk texturing. When designers told Zach he’d struggle to fit no more than seven internal seats, he found a way to fit 15, and when council told him outdoor seating would be impossible, he designed the seats to fit the width of the awnings. Regiment opened in Sydney’s CBD in May 2017 and has been filling seats to the max every day since. Designers Porter and Maple are responsible for the curved timber bench that wraps around the outside of the glass façade, complete with white and black timber and brass furnishings. 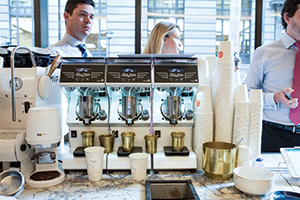 The Synesso machines are custom-made with white wood from Specht Design. Through its spouts Zach runs Five Senses Coffee’s Dark Horse blend, featuring dark chocolate flavours, juicy blackcurrant notes, and an extended syrupy body. Zach says Five Senses has been much more than a company that drops off boxes of beans at the front door. Five Senses supplies all of Regiment’s single origin coffees, which are served for espressos and all filter options via a Marco SP9 for dine-in and batch brew for takeaway. A full commercial kitchen somehow fits into the café with the head chef Lisa Northmore using her fine-dining restaurant experience to create high-end food for dine-in or takeaway, such as the Instagrammable poke bowls, lobster rolls, and poached salmon and cheese croissants. The café also features a natural wine list with three coffee based cocktails on the menu, including cascara tea, a cold brew gin and tonic, and gunfire, a espresso martini variation with more dark rum emphasis. Zach has been working in the café industry for the past 19 years. He opened his first café at age 21 in Mosman, Sydney and from day one, it was busy. He soon discovered the dream of café ownership also included the pressures of staff, management, and finances. “You can build a café but you have to carry it,” he says. Zach thankfully did that and has gone on to operate another six to eight cafés over the years, predominantly corporate cafés. “I was enticed to open another CBD café on the proviso it made a statement. 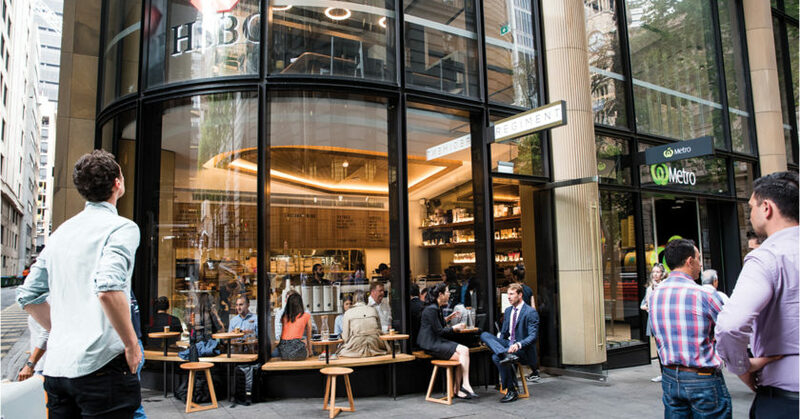 There are lots of mediocre cafés in the CBD. Rather than people going to the city and stumbling upon us, I wanted people to seek us out as a café destination before the location, and I believe that’s what we’ve created,” Zach says. During his time working in hospitality, Zach says he’s fallen in and out of love with café life, but Regiment has affirmed the reason he’s stuck at it so long.